Graceful lines and gorgeous details give the Giselle Collection an aesthetic you will not find in your average bathroom vanity. With matte gold hardware, a gleaming Carrera white marble top, semi-recessed vitreous china sink, and a stunning natural walnut finish, the Giselle 43 inch vanity combo commands attention without being ostentatious. An open shelf and roomy soft-close drawers deliver ample storage. Giselle transforms a blah bathroom into a luxurious spa. Pair it with the matching mirror to complete the look. The Allie 43 inch vanity combo brings to you good looks and generous storage. An uncomplicated design scheme gains luster from the sophisticated Twilight Gray finish with matte gold trim and hardware. A solid birch wood frame, plywood drawer boxes, dovetail joints, a convenient toe kick, and soft-close glides and hinges testify to the quality of construction. The vanity combo includes a carrera white marble top and retangular undermount sink. A large open shelf provides ample storage. The Dexter 43 inch vanity combo offers a combination of styles where country meets contemporary. From its Rustic Gray finish to it striking metal inset, Dexter blends rural and industrial details to create an intriguing cabinet that will be the centrepiece of your bathroom. A solid ash wood frame, soft-close hinges, and simple pulls finished in black bronze complete the look of this unpretentious but beautiful piece of bathroom furniture. The combos includes an integrated carrera white marble stone top. A matching mirror is also available. Dexter defines modern bathroom design. 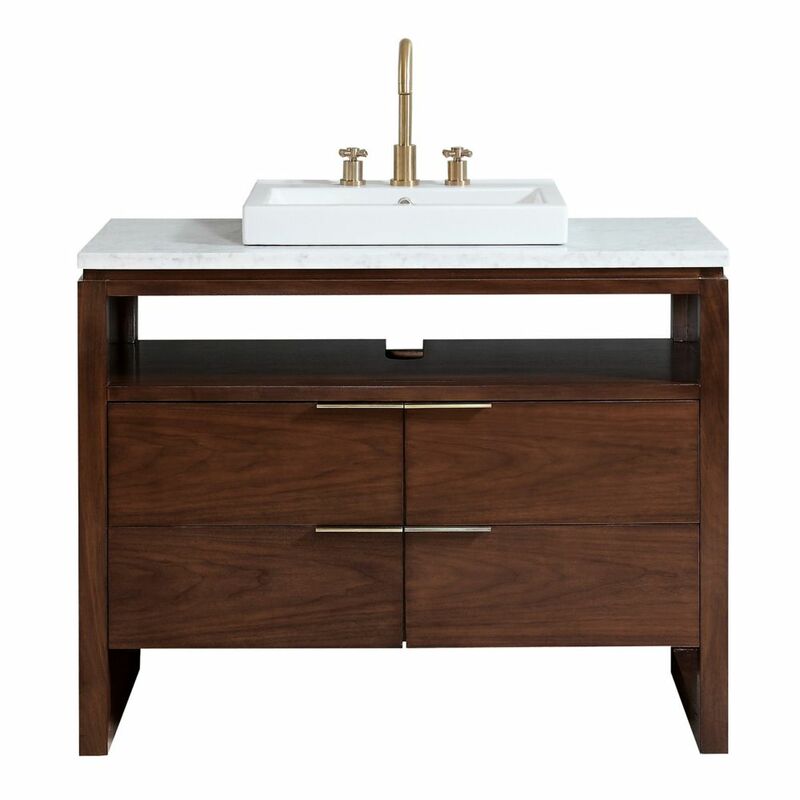 Giselle 43 inch Vanity in Natural Walnut with Carrera White Marble Top Graceful lines and gorgeous details give the Giselle Collection an aesthetic you will not find in your average bathroom vanity. With matte gold hardware, a gleaming Carrera white marble top, semi-recessed vitreous china sink, and a stunning natural walnut finish, the Giselle 43 inch vanity combo commands attention without being ostentatious. An open shelf and roomy soft-close drawers deliver ample storage. Giselle transforms a blah bathroom into a luxurious spa. Pair it with the matching mirror to complete the look.